Oral pain associated with inflammation of the inside lining of the mouth is often a serious side effect of cancer treatments (radiation and chemotherapy). This oral condition is called oral mucositis (OM) and causes redness, mouth ulcers and sores that can be very painful and distressing. Oral pain can make it difficult to eat, drink, and even speak, affecting patients’ quality of life and their social and emotional well-being (Ref. 6). 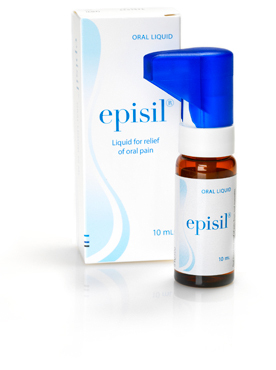 Now there is episil® oral liquid – a treatment for intraoral pain caused by oral mucositis and other inflammatory conditions of the mouth that can help you continue to enjoy eating, drinking, socialising, and getting back to your daily routines. episil® oral liquid has been clinically demonstrated to provide significant oral pain relief that lasts for up to 8 hours, and has no known side effects. When applied in the mouth, episil® liquid forms a bioadhesive film that soothes and protects painful mouth ulcers and sores. The product is ready to use and relieves pain within 5 minutes of application (Ref. 7), so that you can eat, drink, and talk almost immediately.